From today (March 12), people in Cardiff can now use their contactless debit or credit cards to donate to those who are homeless or at risk of homelessness as part of new alternative giving scheme, Give DIFFerently. 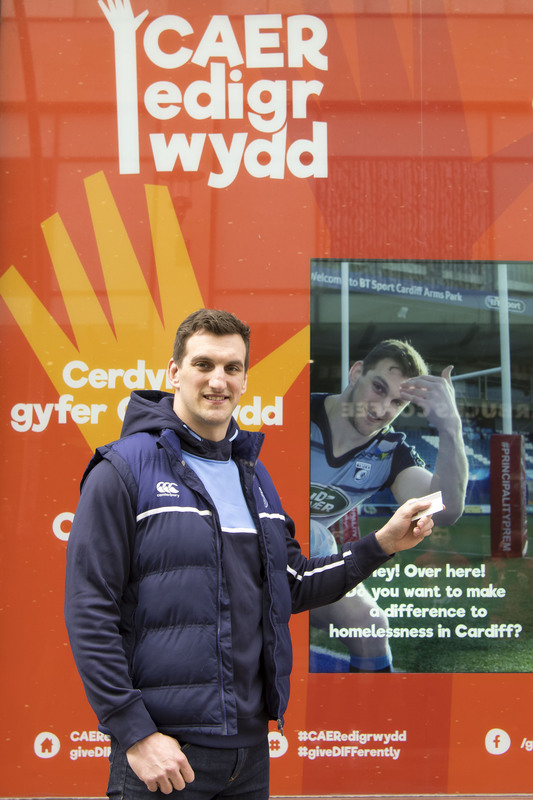 Funded through FOR Cardiff, an interactive screen featuring Cardiff Blues’ Sam Warburton, has been installed on the Hayes. The screen and technology behind it enables members of the public to ‘Card it for Cardiff’ by tapping their card on the window at any time of the day or night. For every tap, a fixed fee of £2 will be put towards small grants for those who are currently experiencing homelessness or at risk of homelessness. The grants will be distributed through the city’ frontline services and donations will be doubled thanks to the Four Acre Trust. Give DIFFerently was launched in November of 2017 to encourage people visiting and living in the city to think differently about how they give to those who are begging, homeless or at risk of homelessness. A partnership between FOR Cardiff, The Big Issue Cymru, Cardiff Council, Community Foundation in Wales, Huggard, the Salvation Army, South Wales Police, The Wallich and Public Health Wales, Give DIFFerently shines a light on the wealth of services provided to help combat rough sleeping across the city, as well as fundraising to provide grants for individuals at risk. Adrian Field, Executive Director, FOR Cardiff, the business improvement district for the city, said: “Feedback from the businesses in the BID area is that cash payments are in decline and according to recent articles it is expected in the next eight to ten years it will only account for 21% of purchases. Cardiff Council, Cabinet Member for Housing and Communities, Cllr Thorne said: “The aim of Give DIFFerently is to end the cycle of homelessness and move people away from rough sleeping by providing meaningful support through small grants that will really make a difference to individuals. Leading Out of Home media owner Clear Channel has worked closely with FOR Cardiff to bring the campaign to life, delivering the interactive screens and contactless payment mechanic, as well as aiding with the creative execution for Sam Warburton’s virtual double. Donations will be managed by the Community Foundation in Wales, where voluntary and third sector organisations can apply for grants from £250 – £750 to help individuals they know need it the most. Ten per cent of the fund will be ring-fenced for organisations working with those at risk of Adverse Childhood Experiences to prevent the next generation from becoming homeless or having to resort to street-based activities such as begging. With financial support of the Four Acre Trust, every £2 donated by contactless payment will be matched, turning each person’s donation from £2 in to £4. The public will be able to donate via the contactless technology until Sunday 25th March or at any time by texting DIFF20 followed by the amount you want to donate to 70070.